Every March a group of Shepley Bulfinch employees (and friends) makes an excursion to the summit of Mount Washington. Situated in the the Presidential Range of the White Mountains in New Hampshire, Mount Washington is notorious for unexpected weather changes. Average temperatures for the month of March are a high of 20 degrees and a low of 5, with sustained wind gusts of up to 60 mph at the summit that can easily create a subzero windchill. Hiking at the tail end of Winter often means that crampons, ice axes, interchangeable layers, and many pairs of dry gloves are required equipment. There are 16 floors in the office building and an approximated 736 average steps per lap (all the way up and down once) after accounting for the stairs, landings, intermittent stretch breaks, etc. Therefore it is estimated that the entire team collectively climbed roughly 349 laps, 11,168 floors, and took 257,269 total steps. It looks like Monday, Wednesday, and Friday were overwhelmingly popular for making the time to fit in stair training around busy work schedules and other committments. 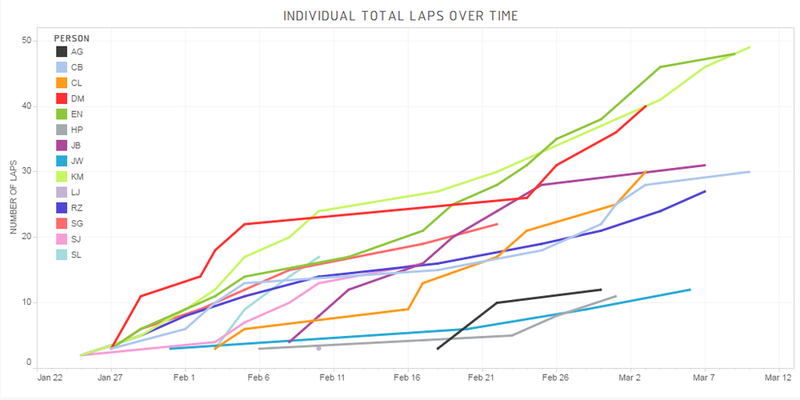 Notice that as weight and amount of laps increased, overall time would often slow down significantly. We lucked out this year with sunny, warm weather for the entire hike. Everyone summited successfully and it was another fun-filled team experience. Special thanks to our fearless guide David Meek who year-after-year invests hours of preparation and tireless effort to ensure a safe journey for all! This winter I joined an adult ski racing league and got back into the sport for the first time in over a decade. Each week racer performance is entered into a complex scoring rubric that determines overall team standings. 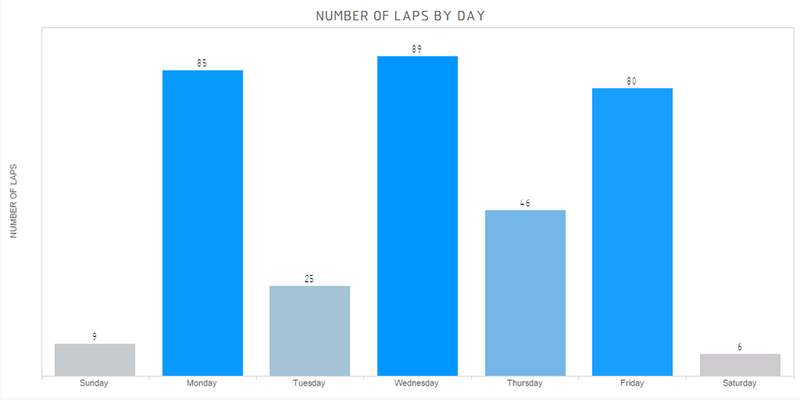 After seven weeks of racing, this rich dataset was too tempting for a data visualization enthusiast like myself to pass up. Each team consists of four members, they can be any combination of males and females. Races occur once a week and two courses are set side-by-side, one red and one blue. Every racer gets two runs per race, once on each course. The racers are ranked according to previous week performance and are paired up by number, this means that you are racing an opponent on every run. 2 Points are awarded if you earn a faster time than your opponent on each run. If your opponent does not show up to race that night and you succesfully finish your run, you receive an easy Win. 2 Points are awarded if your time on a particular course is faster than the time you earned on that course (red or blue) the previous week. Every week, one or two pacesetters will ski the course before all the racers. Their times are divided by their individual nationally-certified handicap percentages to determine the best possible time on that particular course. The fastest of the two pacesetter times is then multiplied against all of the other racers’ times to determine each person’s adjusted handicap time. Each week racers can earn up to 12 Points for their team. The top three highest scores from each team are taken and added to the team’s overall total. At the end of seven weeks, the top 5 teams from each night of the week (Monday-Thursday) are qualified to compete in one final championship race. The highest scoring team wins. At first the results were posted as paper print-outs which resulted in a few hours of manual data entry to build the initial database. After establishing a database, complex calculations were required to reverse engineer the scoring system and then emulate the score keeping based on each racer’s weekly results. Once again I turned to Dynamo’s visual programming capabilities to build a tool that could process all of the information. Ultimately the data helped me quickly understand the league and identify the nuances in scoring that could help improve my performance. It felt to get back out in the course after so many years, I cannot wait to do it again next season! Shout out to my teammates and special thanks to Nashoba Valley Ski Area for generously posting results online and weekly updates. The original dataset can be viewed HERE. Growing up in the agrarian state of Oregon, attending local rodeos during the summer was a favorite family activity. The raw athleticism, toughness, and tradition always made for good entertainment. The humility, sense of community, and incredible treatment of livestock instilled a deep admiration for the country folk for whom rodeo is their entire livelihood. Unlike most professional sports, the cowboys and cowgirls are responsible for personally funding their own equipment, horses, lodging, and transportation. Their lives consist of driving hundreds, sometimes thousands, of miles between weekends to make it to the next rodeo where they compete for a paltry winner-takes-all purse in the 4-5 figure range. A missed lasso toss, a momentary loss of balance, or an overturned barrel can be the difference between earning enough to cover a few more weeks of food, gas, and supplies, or heading to the next event empty-handed. As if the meagre earnings aren’t enough of a deterrent, the physical toll and life-risking courage the sport demands are further testament to the passion and dedication these athletes possess. The first step was to acquire the schedule for the 2015 rodeo season. The PRCA website does not contain a cohesive schedule for the entire season but does post the remaining season schedule as well as the results of each event that has already occured. Luckily the construction of the website is very simple, which made for easy scraping of the data into a format that can be processed. After collecting the lists of information for both the remaining schedule and results, I set out to use Autodesk Dynamo Studio 2016 to parse and re-structure the data for visualization. With the knowledge that the National Finals Rodeo event in Las Vegas in December marks the culmination of every rodeo season, I pared down all events to this timeframe, resulting in 620 total contests. This is a prime example of Dynamo as a powerful visual programming platform independent of Revit. The next step was to merge the two data sources and organize the information by: event name, city, state, country, and first day of event. Once everything was clean and consistent, I exported the data to Tableau for visualization. The Tableau map feature allowed me to position all 620 rodeos across the US and Canada and colorize them based on when they take place during the course of the season. In the end I was surprised to see a moderate cluster of dots in the New England region and was particularly pleased to find rodeos in Western New York, Massachusetts, Connecticut, and Maine. Perhaps there is a contingent of die-hard New England cowboys and cowgirls keeping the spirit of rodeo alive in the East? Regardless, my respect and admiration for this sport will always keep me coming back for more and I look forward to checking out the local rodeo scene. Enjoy! Dynamo Studio "definition" for parsing and re-structuring the PRCA rodeo data. This course highlighted several features of Autodesk Fusion 360, a program that facilitates easy manipulation of 3D geometry otherwise difficult to achieve in Revit. After exporting a conceptual mass family from Revit to Fusion 360, an undulating wall form was created that could then be imported back into Revit, populated with curtain wall using adaptive components and rendered in a perspective street view with Google Maps background. That same form was imported into a program called Meshmixer that provides advanced options for preparing an STL file for 3D printing and allows you to apply custom supports. Altogether, the integrated workflow across several software platforms was relatively seamless and the course exhibited proof that very complex and customized geometry to be created in Revit for any project type. Members of the architecture, engineering, construction and manufacturing industries gathered for this round table discussion about best practices for starting a project in Revit. Two methods were compared, the use of a Template File and Default Project. At Shepley Bulfinch, we use a template file at the outset of every project that contains a minimum amount of views, families and general standards to provide a good starting point. A default project has the advantage of carrying much more initial information including pre-placed families and objects but requires a significant time investment to keep the content current. Overall, the common sentiment in the room was that template files are easiest to maintain and offer the most versatility for any project type. Additionally, it is preferable not to “front load” Revit models and start out with unnecessary file size when one of the biggest challenges among all projects is keeping the model as small and responsive as possible. Are you familiar with the native energy analysis tool in Revit (hint: it’s under the Analysis tab on the ribbon)? This tool has the potential to be very helpful for early feedback to help drive the design. The task can be farmed out to the cloud for faster processing and to post reports for multiple options. For more in-depth analysis, the Revit model can also be exported to GBSxml format and opened in Green Building Studio, a cloud-based energy simulation platform. Relatively specific configurations are required within a model for the analysis to run successfully and one of the predominant takeaways of the course was the emphasis on modeling with energy analysis outcome in mind from the start of the project. This very engaging roundtable discussion examined the emerging role of computational analysis and generative design to help make more efficient design decisions. The keynote address at the beginning of the conference featured the use of "machine learning algorithms" where information and constraints are entered into a computer and simulations are run to determine an optimal design outcome. To start this session, we identified wastes and ineffective behaviors within each profession and in the collaboration process between. After a predictable round of architect-bashing, the question was proposed: "Does computation and simulation allow us to come to confident solutions earlier in the design process and reduce waste?" If existing condition information, user requirements, code constraints and many of the other variables that influence the design process can be programmed to generate permutations, is this a promising direction for the future of the profession? The group came to the conclusion that computational analysis and simulation will never be reliable enough to deliver a comprehensive design solution but may be helpful in providing direction at challenging moments in the process. This course covered work flow and best practices for exporting a Revit model to the Unity 3D, a game engine that enables real-time visualization and walk-throughs. The first step is preparing the Revit model for export by cropping down only what you need with a section box and turning off unecessary categories in Visibility Graphics. Export the model to FBX and import it to 3DS Max where materials, cameras and lights are applied. Lastly the model is imported into Unity where perspectives, walk-throughs and animations can be utilized. In summary, Unity 3D provides a compelling presentation piece that may appeal to some clients but it is important to consider the time investment that goes into the preparation process. An energy and environmental analysis consultant presented a multitude of methods for assessing daylighting, wind, weather, energy consumption and other performance characteristics of a design. 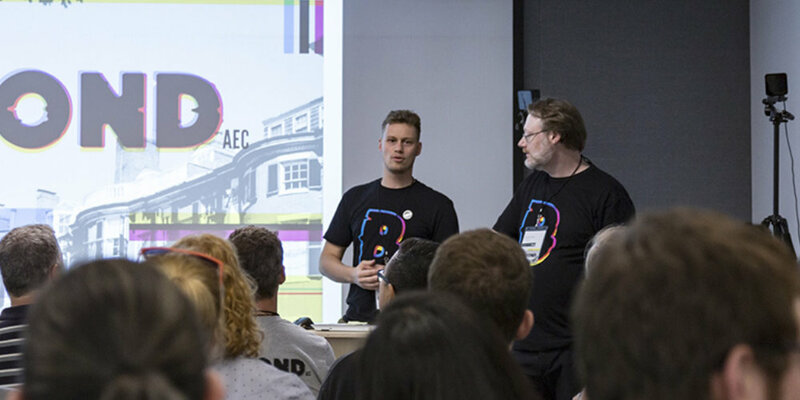 Specific tools covered included eQUEST, Green Building Studio, Autodesk360 Lighting Analysis, raytracing and raycasting, Rushforth Tools Library, Autodesk Ecotect and more. Although these programs were generally too advanced for the level of in-house analysis we use at Shepley Bulfinch, I enjoyed learning about numerous ways information can be extracted from Revit and used to help inform the architectural design process. Beyond parametric modeling and making tweaks within Revit, Dynamo can be used to extract much of the information stored within a model. By using an "export to excel" function, areas, quantities, dimensions, room lists and so much more can be exported and analyzed with the powerful tools Excel has to offer. Schedules can be created, complex building calculations can be scripted and automatically updated upon every change within the model, or checks and balances for code and zoning can be integrated to produce reports. Items can then be adjusted, renamed or resized to push back into Revit from Excel and make direct changes to the model. Dynamo provides a giant step forward in the pursuit of harvesting the full potential of BIM. With all this excitement surrounding Dynamo, did you know there is also a SQL export function? This allows for the creation of a much more comprehensive database that can be thoroughly organized using database management software and mined for analytics and appealing visual graphics in Tableau.